Augmented Reality is slowly and steadily marking its presence in the technology landscape. This year, we have witnessed the growth of Apple’s ARKit and Android’s ARCore. But, AR is picking pace not just by the push of tech giants like Apple and Google, but also individual developers who are pushing boundaries to integrate AR into more. We have come across a Kickstarter project by Asad Jamal that shows holograms of interviewees, which can be viewed with the help of hololens. One can watch these characters coming to life in real life settings. Holograms of people make the viewing experience more intimate when you watch and listen to them as they are questioned by an unseen interlocutor. Augmented Reality sets up an environment of more profound understanding and empathy with the characters as they appear in the same room. The characters that you see as holograms through hololens, share their personal stories of child abuse, drugs, family, work, faith, war, love, and life away from home. These stories become easier to empathise as the Augmented Reality creates the virtual connection and allows the viewers to relate more. 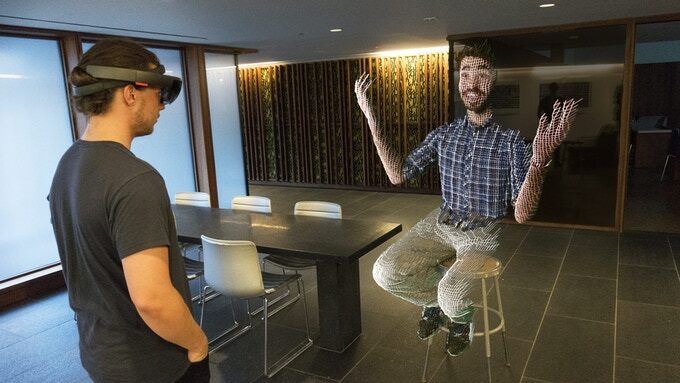 The primary focus of the project is to develop an experience that uses augmented reality capabilities of the Microsoft Hololens to display interactive holograms at exhibitions or events. The Hologram format will create more intimate surrounding and help in deeper understanding. “We’re convinced that the strength of the project lies in allowing the viewer to host and learn from a hologram of someone very ideologically distant from them in their living room,” lists the project page. Technological initiatives cost money, a lot of it, which is why the project “Asad & Assad” has been listed on Kickstarter. For the full-fledged development, the project requires a whopping $120,000. The money is necessary for further development of the project, travel to interview locations and compensate the team of creators. However, for the initial phase, the project developers are seeking $20,000 on Kickstarter. You can check out their page here.